The name's Goldfish. Zombie Goldfish. Fishy mayhem abounds with two more fin-tastic stories from author Mo O'Hara featuring our favorite (New York Times-bestselling!) zombie goldfish. Frankie was a completely normal pet goldfish . . . until Tom's evil-scientist big brother tried to murder him with toxic gunge! Luckily Tom and his best friend shocked Frankie back to life with a battery, and ever since he's been a BIG FAT ZOMBIE GOLDFISH. In Live and Let Swim, a normal trip to the aquarium for Tom, Pradeep, and Sami suddenly turns into a death-defying race to save Frankie from being eaten by a hungry psychic octopus during their big brothers' latest evil plan. Then, when the TV show My Pet's Got Talent comes to town all the paranormal pets suddenly start losing their talents. Can Frankie save the day without his dangerous hypnotic powers? Live and Let Swim by New York Times-bestselling author Mo O'Hara brings back all the kooky fun and humor you've come to expect from this irresistible chapter book series. 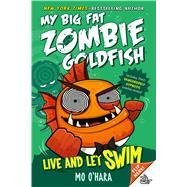 Mo O'Hara is the author of the New York Times-bestselling MY BIG FAT ZOMBIE GOLDFISH series. She grew up in Pennsylvania, and now lives in London, where she works as a writer, actor, and storyteller, visiting theaters and schools all across the UK and Ireland. Mo and her brother once brought their own pet goldfish back from the brink of death (true story). Marek Jagucki, illustrator of the MY BIG FAT ZOMBIE GOLDFISH series, is a graduate of Falmouth School of Art and Design. He is a full-time illustrator and graphic designer based in Yorkshire, UK.